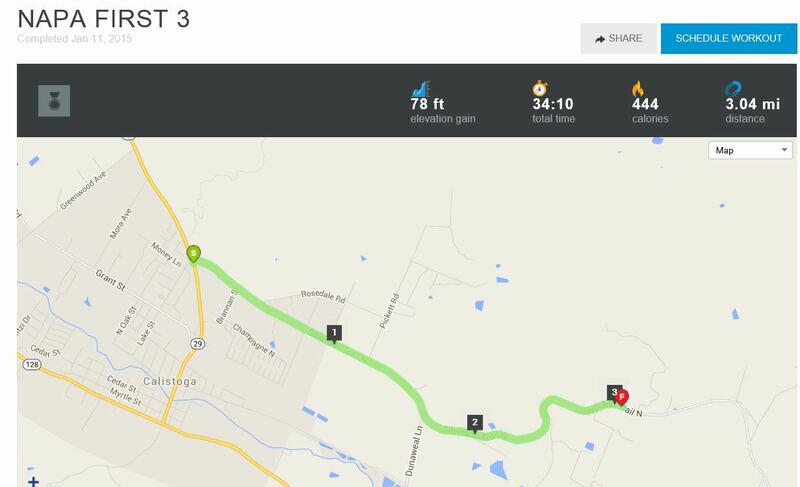 Virtual Running of Napa Valley Marathon With IFIT Map Creation! We just found one of the most amazing benefits of IFIT ! First of all IFIT is incorporated in exercise equipment today and lets you virtually run, bike on pre-defined maps created by IFIT as well as IRunMaps . As you are running the different courses you are able to see a street view of the course as well as have your treadmill automatically incline and decline based on the elevation of the course you are running. As we were looking through the maps the other day while preparing for a training run for the upcoming Napa Valley Marathon, we came upon “create your own map”. When we saw this we wondered if this would give us the ability to create a map of the marathon we would be running. Low and Behold it did! We actually created several maps with different mileage so that we could run segments of the marathon during our training runs instead of having to run the entire marathon. We created a map of the entire marathon, a half marathon and then 6 miles segments along the marathon path in case we don’t have time to run a full marathon on training day- yeah right, like we am going to run a full marathon on training day!!! The beauty of creating and running your own map is that you are able to prepare for the course that you are going to be running. I have completed miles 1-9 so far and now know what the incline/decline’s are going to be during the race so it wont be such a surprise on race day. It also gave me the ability to see the scenery on the course as well as the path that we would be running on – again what a great way to experience and practice running the course before race day! If you are on IFIT you can also share your maps with your friends and with other members of IFIT! If you are a member of IFIT, feel free to reach out and add us to your friends list! Only 37 days left till Marathon Day- 25 more training days (2-3 more long runs)!!!! This entry was posted in Technology and tagged IFit Maps, IRun Maps, Napa Valley Marathon by TwogetherRunners. Bookmark the permalink.